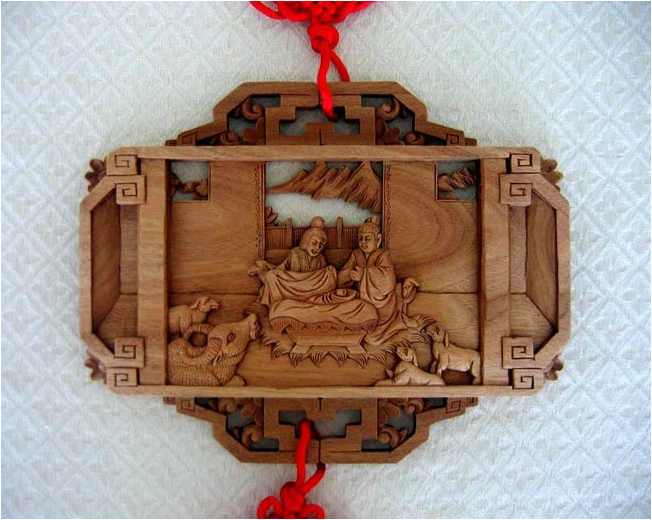 This rectangular wooden wall hanging depicts the Holy Family and animals. The scene is completed with Chinese knots and tassels. Knots are a symbol of unity in Chinese culture (what a great symbol for the Holy Family!). The choice of red for the knots and tassels is also important. In addition to attracting luck, red is the color of joy and happiness in Chinese culture. Thus Chinese brides always wear red; the origins of this practice can be traced back to the Song dynasty (960-1279). The scene was designed by a Chinese Christian man, requiring four days of hard work to complete. The total length of this hanging is 31 inches. The wooden carving itself measures 8 inches high and 10 inches wide. The wood is aromatic camphor wood. The stain is medium brown. Mary and Joseph smile as they look at their baby in his manger. A mountain landscape is seen from the family’s window. The family is surrounded by five lambs and a water buffalo. The water buffalo is a symbol of the spring season and also endurance in Chinese culture. Water buffalos are intelligent and they have particularly strong senses of smell, hearing, and direction, which warn them of trouble. They can hear their master calling from miles away. A great protective symbol to associate with the Holy Family!